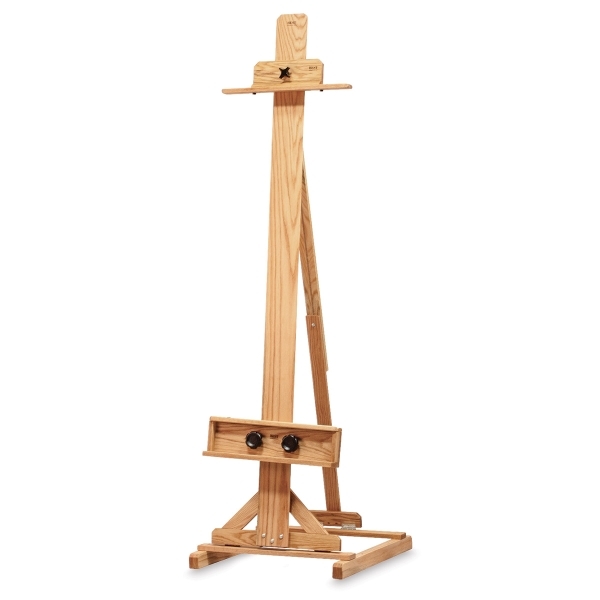 Best's Chimayo Easels offer a strong and elegant single-mast design. They adjust to a variety of positions for both sitting and standing, and fold flat easily for storage. Chimayo is perfect for apartment living, for a cottage or second home, for an office or den where space is limited. Many artists choose Chimayo as their second easel. 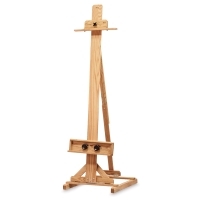 They are elegant and complement any decor, yet they do not require the huge footprint of larger H-frame easels. 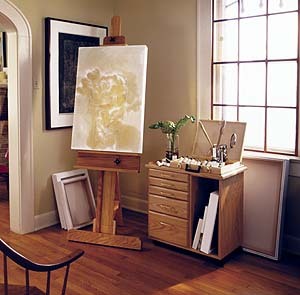 Like other professional easels from Best, they are made with hand-rubbed, oil-finished, solid oak. They're popular with students and professionals because of their quality, compactness, and economy. Top and bottom painting trays slide up and down, then lock securely into place. They have rubber grips to hold the canvas secure. A wedge-lock system keeps the painting from wobbling. Legs have rubber feet to prevent sliding on smooth surfaces. On the two larger models, the painting tray has an extra shelf for supplies. Best offers three models in the Chimayo family, like a papa bear, a mama bear, and a baby bear, to fit different painting requirements. They represent a tradeoff of strength and stabilty for compactness and portability. Put a full-size Chimayo in your studio and a Medium Collapsible Chimayo in your guest cottage, while keeping a Student Chimayo in your pied-à-terre. Chimayo Easel — Best's full-size Chimayo is a single-mast easel supported by a quad base, giving it greater stability than other single mast easels. It distinguishes itself in being able to support quite a large canvas for a single-mast design, up to 72" tall, and with greater stability. It offers a small utility shelf under the bottom canvas holder. Canvas holders adjust to any position along a fixed mast. Ships from the factory by UPS. Light assembly required. Medium Collapsible Chimayo — Best's Medium Chimayo has an adjustable and collapsible mast that slides in a rugged box frame. It can be raised to a full height of 82" (208 cm). When collapsed, it stands only 52" (132 cm) high, suitable for a table top. For storage, the mast drops down into the frame, and legs fold flat. It is supported by a T-frame base, which makes it slightly less stable than the full-size Chimayo, but more compact for storage. Maximum canvas height is 66". Ships fully assembled from the factory by UPS. 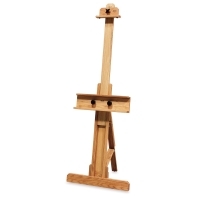 Student Chimayo — Smallest member of the Chimayo family, it has an adjustable and collapsible mast like the Medium Chimayo, but lacks the utility shelf. 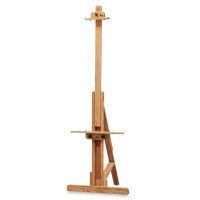 Although it can support canvases nearly as tall, it has a narrower and lighter mast and a slightly smaller base. The Student Chimayo most closely resembles the Medium Chimayo, but gives up some strength and stability in exchange for greater compactness and portability. Ships fully assembled from the factory by UPS.